The 2019 Earth Day Photo Contest is underway. Vote for your favorites now through Sunday, April 21! Our annual Earth Day Photo Contest is back! From South Minneapolis to Watertown Township, Laketown Township to Medina, we think our watershed is incredibly photogenic. There is endless beauty on and around the 129 lakes, eight major streams and thousands of wetlands within the MCWD, and we want to see how you capture it. We encourage you to submit pictures of you, your family, and your friends enjoying the resources our watershed has to offer. First place winners in both categories will receive a $100 gift certificate to The Great Frame Up and will be featured in MCWD's annual report. First, second, and third place winners in both categories will be featured in MCWD's e-newsletter and on MCWD's website, Instagram, Facebook and Twitter. There is a lot to see and do in the 178 square miles of the Minnehaha Creek Watershed. This page introduces you to just a few of the many great places for recreation. Check them out and send us your own ideas and photos! Minnehaha Creek flows 22 miles from Lake Minnetonka to Minnehaha Falls, winding through tranquil woodlands, expansive wetlands, dense urban landscapes, neighborhoods and scenic park land. Under the right conditions it affords paddlers a beautiful adventure through an urban wilderness. 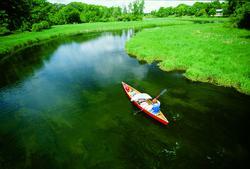 What are the best conditions to paddle Minnehaha Creek? Ideal creek flows for paddling are between 75 and 150 cubic feet per second (cfs). We do not recommend paddling when the creek's flow is higher than 150 cfs. Conditions can change rapidly, especially after rainfall. View the Minnehaha Creek's flow level at Hiawatha Ave here. We recommend using the flow at Hiawatha Ave to gauge how fast the creek is flowing in the lower half of the creek, and the Gray's Bay Dam discharge to gauge how fast the creek is flowing in the upper half of the creek. Please note that creek flow is different from dam discharge, as water runs into the creek from different sources like runoff, storm sewers, wetlands, etc throughout the length of the creek which impacts the flow. Where Can I Find the Lake Level for Lake Minnetonka? View the lake level for Lake Minnetonka. Where Can I Find the Lake Levels for My Lake? 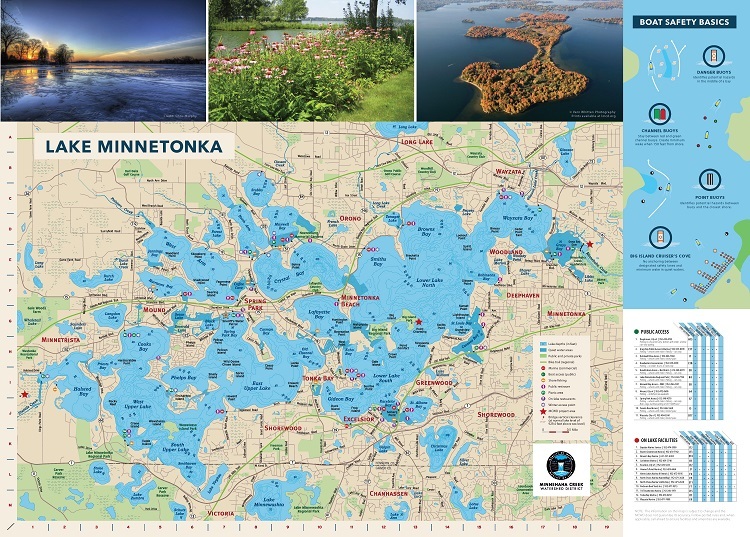 The Minnesota Department of Natural Resources' Lake Finder has a wealth of information for lakes throughout the state of Minnesota. Lake levels for many of the lakes is available. What is the Flow of Minnehaha Creek at Hiawatha Ave (Minneapolis)? The United States Geological Survey (USGS) has a real-time, automated staff gauge that measures the flow (discharge) and precipitation. Can I Paddle Minnehaha Creek? See the Paddle Minnehaha Creek web page. As the weather warms, have you noticed dead fish along the shoreline? Unfortunately, winter fish kills are an annual occurrence, especially when we've had cold winters with abundant snowfall. During the winter, some fish become trapped in shallow pools of water and are unable to move to deeper water or downstream. Underwater vegetation creates oxygen in the water through photosynthesis, however, during the winter, plants are not able to photosynthesize as much due to ice and snow cover. As a result, the shallow water where fish get trapped has low dissolved oxygen, making it difficult for some fish to survive. Winter fish kills rarely result in the death of all fish in a lake and may even help naturally kill invasive common carp. Typically, wading birds and birds of prey will use the dead fish as a food source, and as the water levels rise in the spring, the fish will be carried downstream. Dead fish can also be buried or used as fertilizer. In general, fish kills will not have a significant negative impact on water quality. They can be reported to the Minnesota Duty officer at 651-649-5451. If you find a fish kill of the same size and species in the spring, the cause is most likely disease related. As fish spawn and compete for food in shallow spring waters, they weaken their bodies and become more stressed, making them more susceptible to disease and infection. If the fish kill includes fish of different sizes and species, you should notify the Minnesota Duty officer at 651-649-5451. Blue-green algae is "algae" in name only – it is actually a "cyanobacteria" that can produce toxins harmful to people and animals. When water conditions are right, blue-green algae can bloom, covering areas of the water in a thick, dense mat. It is found in lakes, ponds, and slow-moving streams. Send the MCWD a photo from the district!